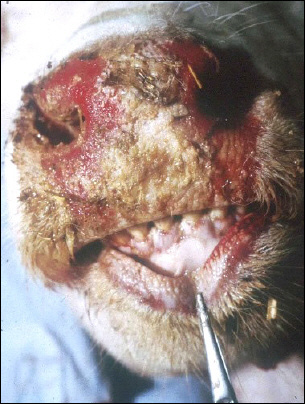 Only persistently infected animals are at risk of developing Mucosal Disease . During their fetal development they were infected transplacentally with ncp BVD virus. Due to the immaturity of their immune system at that point in time they failed to develop antibodies against the virus. Instead they developed a life-long immunotolerance against this pathogen. If in the course of their lives they are superinfected with an antigenetically homologous cp BVDV, this will be recognized as “self” and therefore not eliminated by the immune system. This superinfection is the trigger of the dreaded Mucosal Disease. It might be assumed that the probability of a superinfection with an antigenetically identical virus of the other biotype is a relatively small one. If however, one considers that a life-long natural selection for the persistent virus takes place in the body of the PI animal (for antibodies are indeed developed against antigenetically different BVDV) and that Pestiviruses, being RNA viruses (their rna-polymerase lacks proofreading capabilities), have a high mutation rate, which means that mutations from ncp to cp occur quite often in the pi population, it is not surprising that MD occurs frequently in relation to the incidence of PI animals. It is, however, not known whether all persistently infected animals catch MD. Recently, it has been shown that antigenetically heterologous cp BVDV is able to trigger MD, albeit under the condition of the immune system being artificially suppressed (by dexamethasone)  - see also “Early & Late Onset” on the next page! This means that the antigenic homology does not appear to be relevant to the pathogenesis of MD, as opposed to the evasion of the immune system. MD is in the majority of cases diagnosed on the basis of anorexia, raised temperature, therapy-resistant watery or bloody diarrhoea, serous to muco-purulent nasal secretion and cough. This list is extended by mucosal lesions in the mouth as well as erosions and ulceration on the muzzle, the nose, the coronet and the interdigital cleft. 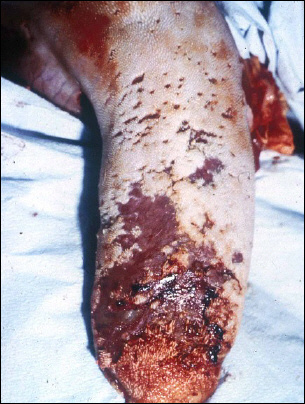 The disease varies from acute to chronic (death usually within a few weeks after onset of clinical signs). Pathology reveals mucosal lesions in the entire gastrointestinal tract as well as, occasionally, pneumonia. Mucosal Disease is always fatal, therapy is useless. The disease can occur at any age, however, the losses are greatest when animals under 2.5 years of age are involved. The accurate mechanism of cell damage is as yet unknown. However, cp BVDV results in a rapid depletion of the lymph follicles of Peyer's patches. This depletion can also be triggered by infection with highly virulent ncp BVD virus strains . 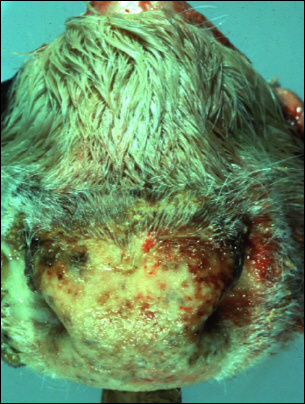 It is known that following experimental superinfection with cp BVDV (antigenetically homologous with the persistent ncp BVDV) some persistently infected animals show the first symptoms of MD after only two weeks, with others, however, the symptoms take many months to develop. The two types are called early onset and late onset MD. Antigenic comparisons and sequence analyses of the viruses involved give rise to the supposition that different pathogenetic mechanisms are involved. In early onset MD the disease is triggered directly by the superinfecting virus, whereas in late onset MD there is genetic recombination between the persisting ncp BVDV and the superinfecting cp virus. There is a delay before the disease is triggered as the immune system fights against the new recombinant virus .